God’s Will and Paul’s Missionary Plans, or, How did Paul know where he was supposed to go? | Open Our Eyes, Lord! Let us say then that a Christian believes that God is calling him or her to the mission field. One of the most pressing questions, always, is: I know I’m going…but where do I go? How can I be sure when the whole needy world lies before me? The church does not have the privilege to shrug its shoulders and leave this a mystery, not when we have the New Testament to guide us. When I say the New Testament, I do not mean that we may select out one verse of Scripture, such as the vision of the Macedonian man in Acts 16:9-10, and use that as the one and only word on the topic. In fact the New Testament does not provide a formula, but nevertheless it shows us a range of godly ways in which a missionary should make decisions. The question: How did Paul, as a Spirit-filled missionary, know where to go? When he was at a crossroads, how did he know to turn to the right or to the left? How did he know it was time to leave and when it was time to stay longer? The New Testament (in Acts and in Paul’s epistles) describes 49 turning points in Paul’s missionary work. Clearly, Paul’s motivations were multiple at some of these junctures. For example, one move is recorded in both Acts 9:23-25 and 2 Cor. 11:32-33. Both texts mention a death threat as one motivation. But it is also implicit that Paul wished to meet with the apostles in Jerusalem. Human motivations are complex, especially when made by Christians led by God. Beyond this complexity, it is probable, that while the text of Scripture describes Paul’s movements with accuracy, it does not give his entire set of reasons for each move. Hence, Paul elected to stay in Ephesus because of the “great door for effective work” there (1 Corinthians 16:8-9 leaves open the possibility that he may have had further motives). Beyond that, there are plenty of passages where the text tells us nothing about motivation (e.g., the trip to Corinth in 1 Cor. 16:5-7) or where the text may imply a reason but we are not certain. And let us not forget that Paul made many moves that were simply not recorded at all, including his acts during his “silent years” (before he turned up in Antioch in Acts 11:25). Yet, having affirmed all this, we can nevertheless find much useful data, and these available data are likely to represent the broad range of experiences in Paul’s life. Two motivations show up nine times each: travel in response to direct divine revelation; travel in response to dangerous local circumstances. Direct revelation:  Paul received revelations by prophecy, vision, audible voice, and angelic visitation. These revelations sometimes came in tandem with other motivations, such as a death threat. The messages could be positive (go here!) or negative (don’t go there! don’t be afraid! don’t leave here now!). It is not known how the Spirit blocked Paul’s entry into Asia and Bithynia, but that leading was clear to Paul and his team (see Acts 16:6-9). Another unexplained supernatural impediment came through “Satan’s hindrance” (1 Thess. 2:17-18) [2 re: Acts 20-21]. Of course, the Damascus Road vision was the foundation of Paul’s entire ministry. This call, which rivaled any experience of the Hebrew prophets, not only made Paul a missionary, but summoned him to evangelize the Gentiles in far-flung areas. Whatever Paul did subsequently was a direct application of that vocation. He also understood his work in light of the Scriptures, particularly Isaiah (cf. the allusions in Acts 26:18, the quotations in Rom. 15:8-12). What is noteworthy by its absence is any reference to inner leading or inaudible voices. When Paul made statements such as “The Lord told me to go to Macedonia,” he meant that he had heard audible words or seen visible revelations. Dangerous circumstances:  These included death threats, plottings, and expulsion. The Lord had already instructed his disciples that they should depart from cities where they were persecuted, rather than court vain destruction (Matt. 10:23). To this category we may add that Paul preached to the Galatians due to an illness (Gal. 4:13-14). Acts leaves the reader with the impression that the greatest opposition to Paul came during his initial visit to a place. However, that may simply be Acts’ style of reporting pioneer work in greater detail, perhaps leaving out accounts of whatever persecution broke out during subsequent visits. In fact, this is demonstrably the case in 1 Cor. 15:32, where Paul’s tangling with “wild beasts” goes unmentioned in Acts. Many Christians today speak of seeking for God’s “open door” in order to know what to do or where to go. The assumption is that God will leave open one and only one opportunity, and will close every single other possibility. Did Paul make his decisions that way? To be sure, he speaks as if he perceived both open doors and closed doors. Yet there is never any indication that he only had one possibility at a time. We never sense Paul with only one option before him. Therefore, let us not ask God to close doors if we are not also willing to pray and study hard in order to determine what is the most biblical course of action! Missionary Strategy:  Strategic planning for ministry is a topic in itself. For our purposes, let us simply note that there are a dozen or so texts where Paul seems to have moved from one place to another simply “because it was there” and because it fit in with his initial call [list]. It should not be surprising, then, to find Paul taking one step after another without reference to repeated “Macedonian visions.” We see him working strategically, and managing these complex comings and goings of himself, his letters, and his deputies. For example, Paul wrote 1 Corinthians from Ephesus, then went to Troas for a rendezvous with Titus, who was heading there from Corinth, apparently by way of Macedonia. Titus didn’t show up, so Paul became concerned and went ahead to Macedonia. There Titus finally met him and conveyed the relatively good news about the Corinthian church. In response, Paul wrote 2 Corinthians. All this took place in just a few months out of his schedule, and reveals the existence of deliberate movement. 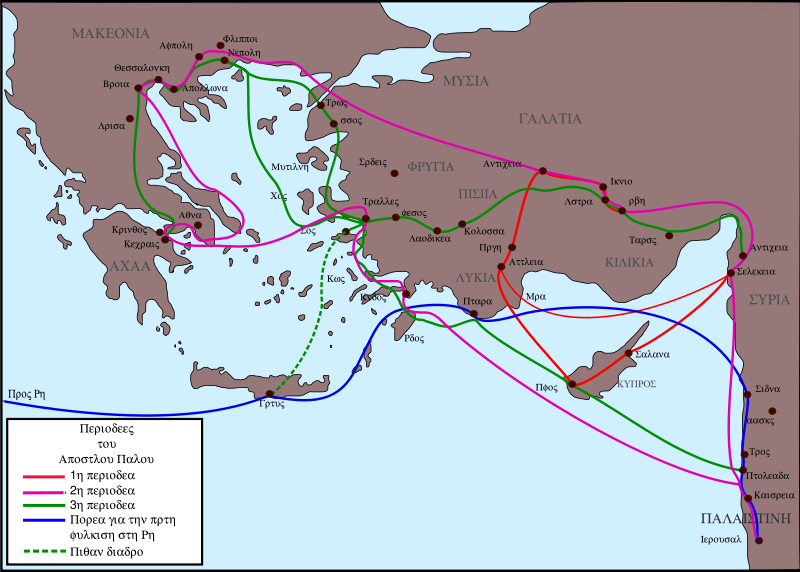 The schedule was flexible, too: his original design had been to go first to Corinth and later to Macedonia. How do we reconcile the three main motivations: revelation, circumstances, strategy? It looks as if the occasional appearances of angels and prophecies were not driving Paul. It was his assignment from the Damascus Road that drove him, and these further revelations or circumstances were simply nudges to fine-tune his direction one way or the other. Aloud or in writing, Paul was comfortable with using language such as “I plan, wish, desire, hope, I have decided, it is my ambition, my prayer.” His changes of plans led some Corinthians to suspect him of waffling (2 Cor. 1:15-2:4, our comments on 1 Corinthians 16:5-7), but Paul responded with careful reasons for the altered timetable. He strikes us as a man who was constantly thinking ahead, moving in optimum fashion and always with prayer. If Paul believed the Lord was also leading him with some sort of inner inclination, would he not have given God credit in 2 Corinthians and said “I’ve made, but it is God who told me to visit you later on rather than immediately”? It does not seem likely: (1) Paul never mentioned inner leading, notably in those places where we might expect to have heard about it. It would have aided his aims in 2 Corinthians or Romans immensely if that were a fact he could reveal; (2) Paul changed his mind often enough that he was clearly not following an infallibly conceived and communicated heavenly plan. Romans 1:10-11 – He has prayed that God would allow him to visit in Rome, so that he could teach there. Romans 1:13 – He has laid plans to travel to Rome before, but been prevented so far. We do not know what the hindrance was, but part of it was that he has wanted to finish the work in the East (15:22-23). Romans 15:24-25 – Paul plans to visit Jerusalem, then Rome, then Spain. In these texts we see Paul praying and setting an itinerary. His plans were carefully gauged by his call to plant churches in new areas. However, the text offers us little help in answering why Paul chose Spain. We can make a good guess: Paul was moving westward anyway, Rome was evangelized, and Spain is to its west; Spain is in the empire and well regarded; it was “virgin territory,” fitting with Paul’s method. But why Spain rather than, say, Gaul? Why not the German barbarians? Indeed, why not Africa or Mesopotamia? But what happened to the Spain mission? Paul could not carry out his schedule, at least not in the way he had conceived it. He would not get to Rome for another three years. If he ever got to Spain (and it is doubtful) it was at least another eight years after writing Romans. Eight years was a long period of time, considering how quickly Paul moved. What if Paul stood before the Antioch Missions Committee? Would they have asked him, “Brother, do you believe in your heart, beyond a shadow of a doubt that God wants you in Spain?” Paul would have answered that he did not know that, but that he would have that assurance if and when he arrived on Spanish shores…unless in the interim some revelation gave him surer knowledge. Yet, at another point in his career, he could have stated that he was certain that God indeed wanted him to sail from Asia to Macedonia or that he was certain that God wanted him to stay longer in Corinth despite the opposition. But let us affirm that both are possible! Paul was driven fundamentally by Christ’s commission on the Damascus Road, an incontrovertible word from God. Paul understood that he was to focus on planting Gentile churches in unreached areas. Paul never mentioned “inner” revelations when he talked about how he decided where to go. 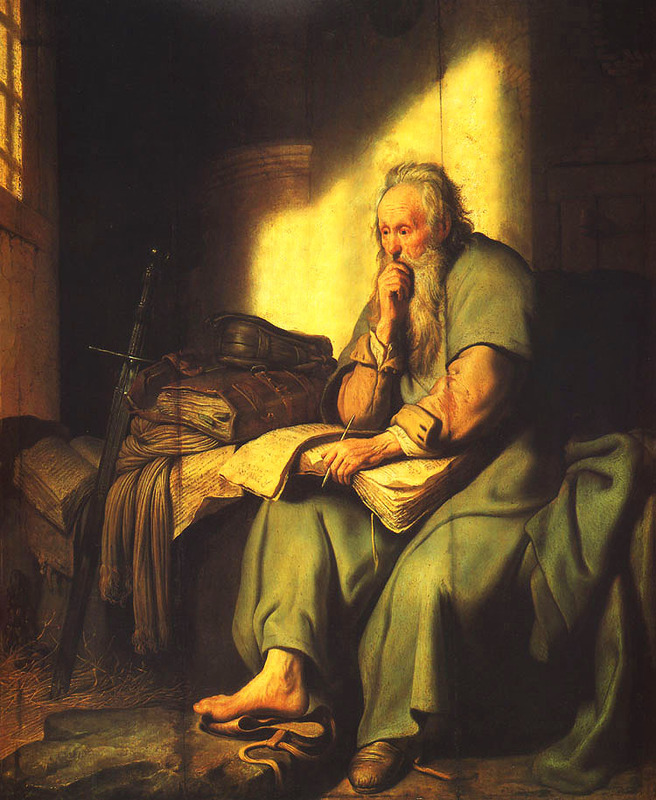 Paul mentioned “open doors” and was prohibited from some areas, but he never hints that that is his main source of direction nor that God normally left him with only one “open door” at a time. Paul sometimes received new revelations from God, but he moved ahead with his work with or without them. Apart from his Damascus Road vision, these later direct revelations gave help in the details, but not with the basic direction. Paul was almost constantly on the move, and he laid plans that he understood to be in line with the Bible, his commission, and – apparently – a wisely conceived strategy. When asked, he could articulate his reasons for his itinerary. Paul sometimes changed his plans for strategic reasons, or had his mind changed for him by revelation or circumstances. Paul followed the directive to leave dangerous areas unless otherwise guided. However, while he took seriously the warnings to avoid Jerusalem, he seems to have known that he was permitted to accept the risk and go anyway. There is no reason for the modern Christian to limit him/herself to one or two of these points, nor to eliminate any possibilities from the list. Christians who are waiting for a vision might also want to study the New Testament to see what it is that God wants in the world today. And those whose thinking is more logical and rationalistic will certainly want to pray too for God’s prodding. I would include: Acts 9:29-30/22:17-21; Acts 11:30; Gal 2:1-5; Acts 13:3-4; Acts 16:6-7; Acts 16:8-10; Acts 18:9-10; Acts 20:22-24/21:4/21:10-14; Acts 27:21-26. One sticky issue is what to make of the interaction between the Spirit’s guidance and Paul’s plans in Acts 20-21. What seems likely is that first of all, Paul believed that Christ had directed his collection for Jerusalem. He was also “compelled” to go, which may or may not indicate supernatural direction. Second, he was told several times that he would face hardship or death, and that he should not go to Jerusalem. Paul responded by brushing aside the prophetic notices with the rejoinder that he was willing to risk his life “to complete the task the Lord Jesus has given to me.” Perhaps we should understand the prophetic words not as direct orders, but as warnings that Paul was free to set aside if he was willing to accept the risk. Here I would include: Acts 9:23-25/2 Cor 11:32-33; Acts 9:29-30/22:17-21; Acts 13:50-51; Acts 14:5-6; Acts 14:20; Acts 16:35-17:1; Acts 17:10; Acts 17:13; Acts 20:3. At the least I would include Acts 14:21-23; Acts 14:24-28; Acts 15:36; Acts 18:18; Acts 18:23; 2 Cor 10:15-16; Rom 15:17-22. The list could easily be augmented. I really appreciate this insight as a missionary! Thanks. You bet, Michelle, blessings! I’m a missionary in Costa Rica. Excellent Gary; thanks for this.